Portugal is the sixth largest wine producer in the world. It is not surprising, therefore, that one of the main demands of its visitors is aimed at enjoying the peculiarities of its wines. In the north of the neighboring country, five wine regions stand out in which, in addition to tasting their products and discovering the entrails of their elaboration process, travelers will be able to enjoy authentic cultural and landscape emblems. Vinhos Verdes. This wine region is the largest in the neighboring country. In total, it extends along 34,000 hectares. According to certain peculiarities like the climate or the types of wines, the Vinhos Verdes region is subdivided into nine regions: Lima, Cávado, Amarante, Ave, Basto, Baião, Monção, Palva and Sousa. The area of ​​production of the green wines is located between the river Miño and the Valley of Cambra. Its name is due to the youth of the grape with which they are made, which gives them an acid touch and a freshness characteristics. In addition to enjoying the taste of its wines, you can visit different territories and monuments of great cultural value. The historical center of Guimaraes, declared a World Heritage Site in 2001, is an example of the architectural evolution of Portugal between the 15th and 19th centuries. Its neighboring city, Braga, has two centuries of history that make it one of the oldest cities in Portugal. Monuments like the Sanctuary of Bom Jesus or the cathedral are some of the exponents of this veteran. Oporto and Douro. The grapes of Oporto and the Douro are grown on the terraces of the Duero, listed as a World Heritage Site by UNESCO. It is precisely these areas of cultivation that make the Region of Alto Duero one of the most beautiful in Portugal. Duero wines are classified in reds, rosés and whites, although Muscat is also produced, young wine, wine of late harvest and sparkling wine of the Duero. Of all the specialties of the Duero it emphasizes the Port. This broth is famous for its sweetness, and is that it is made by interrupting the fermentation of the must. In this wine region you can admire the immensity of the steep nature of the Duero from the viewpoint of St. Leonardo de Galafura. If you prefer to discover the architectural heritage of this territory, you can visit cities like Lamego, where is the Baroque Sanctuary of Our Lady of Remedios. Dão and Lafões. Located between the coast and the interior of Portugal, this region stands out for its white and red wines. The former are aromatic and fruity. The aroma also highlights in the seconds, which have more body. Lafões reds, a transition region between the Dão region and that of the Vinhos Verdes, have a higher acidity similar to that of the latter. The thermalism and the cultural tourism share in the protagonism with the enotourism in this region. Its most important city, Viseu, has monuments belonging to different eras. Necropolis and prehistoric dolmens are fused in their landscape with medieval fortifications or temples of styles that go from the baroque to the rococo. The thermal center of São Pedro do Sul is also located in Viseu. It is one of the most visited thermal springs in the country due to its curative qualities and serves as a starting point for discovering the healthy properties of the waters of the region. Távora and Varosa. This wine region stretches along 2,100 hectares. In them, the granite soils predominate and the continental climate, dominated by extreme temperatures. It is an area whose wine production is ancestral, since there is evidence that places it in the Roman Empire. The vineyards grow between 500 and 800 meters above sea level. This causes the grapes to retain better the acidity in optimum conditions for sparkling wines. For a century, this region also contains plantations of Chardonnay and Pinot Noir, both species originating in France. With regard to the cultural heritage of this region, there are traces of the passage of Romans, Suevi and Visigoths through it. It was also one of the favorite territories for the Cistercian Order. Proof of this is the Monastery of St. John of Tarouca, the first erected by said order the Portuguese territory. Trás-os-Montes. It is a mountainous region and mostly granitic soils, divided into three subregions: Chaves, Valpaços and Miral Planalto. 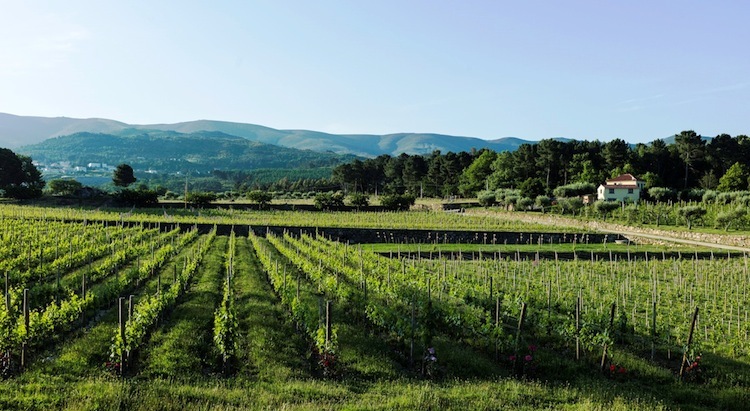 As with Távora e Varosa, the cultivation of its vine was carried out by the Romans for the first time. The metamorphosis that its landscape experiences at the same time, makes it one of the most attractive regions. They emphasize its extensive green valleys, its olive groves and almond trees in bloom and its centuries-old vineyards. Crops differ according to the subregions to which they belong. In the Mirandese Plateau they are influenced by the river Douro. In keys, the vine is planted in the terraces of small valleys that go to the Tämega river. Valpaços, on the other hand, is located in a flat extension crossed by diverse streams.